Yes, it's possible. And delicious. 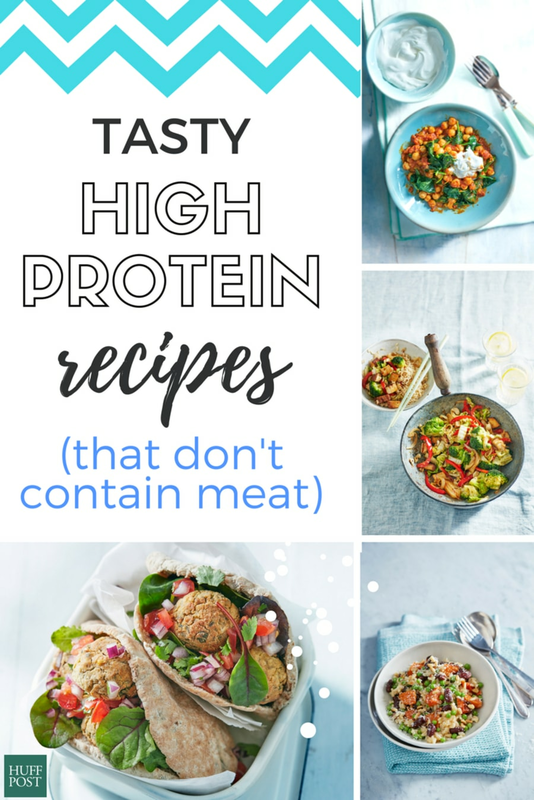 If you're like most and think a meal needs meat to be high in protein or nutritionally complete, you need to try these protein-rich plant based recipes. 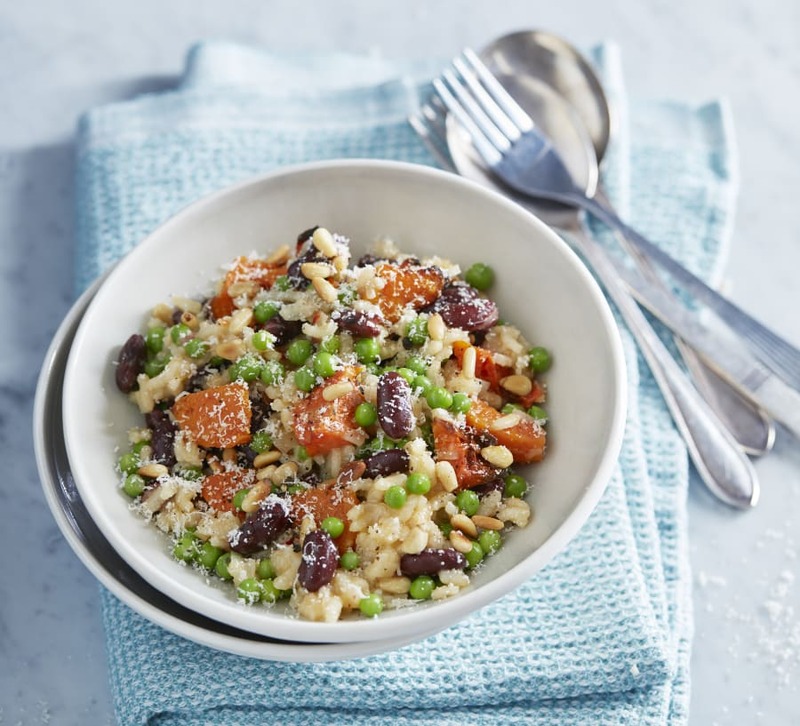 Whether you're vego, vegan or simply want to cut back on your meat intake, swapping meat for protein-rich legumes, beans, peas and whole grains is a great idea. It helps you up the fibre (your digestive system will thank you), as well as increase the mixture of phytonutrients which possess potent antioxidant effects. From baked falafel pita pockets to butternut pumpkin risotto, these recipes from The Vegetarian Athlete's Cookbook by Anita Bean have got you sorted. "This is a perfect refuelling meal after a long workout. It contains a 4-to-1 ratio of carbohydrate to protein, so will restock muscle glycogen stores as well as promote rapid muscle recovery," Bean said. "The beans and peas supply high levels of protein and fibre, while the pine nuts give you omega-3 oils that also promote recovery." Heat the olive oil in a large heavy-based pan and cook the onion over a moderate heat, stirring frequently, for about three minutes. Add the chilli and garlic and continue cooking for about one minute. Add the rice and continue cooking for 1–2 minutes, stirring constantly until the grains are coated with oil and translucent. Add the butternut squash and half of the hot vegetable stock, then bring to the boil. Reduce the heat and simmer gently until the liquid is absorbed (about five minutes). Add the remaining stock, a ladleful at a time, stirring and continue to simmer until the rice is almost tender (about 15 minutes). Add the red kidney beans and peas and continue cooking for a further five minutes. As a guide, the total cooking time should be around 25 minutes. Remove the pan from the heat. Stir in the grated Parmesan and pine nuts, and season with lots of freshly ground black pepper. Serve with Parmesan shavings and extra black pepper. "Falafel are perfect for al fresco eating -- picnics, barbecues -- as well as lunch on the move," Bean said. "Chickpeas are packed with protein, fibre, iron, manganese and magnesium. They also contain fructo-oligosaccharides, which increase the friendly bacteria of the gut that improve digestion. These falafel are baked instead of fried, so they don't absorb extra oil." Serves two (makes approx. 12 falafels). Preheat the oven to 200/180°C fan forced/gas mark 6. Lightly oil a baking sheet. Put the chickpeas in a blender or food processor and process for a few seconds. Add the onion, coriander, mint or parsley, garlic, spices, gram flour paste and olive oil. Process for a few seconds until combined and a fairly smooth, stiff purée. Form the mixture into balls about the size of a walnut. You should be able to make about 12. Coat lightly with a little gram flour. Place on the oiled baking sheet and cook in the pre-heated oven for about 20 minutes until golden, turning once. Meanwhile, make the salsa. Finely chop the tomatoes and mix with the onion and coriander. Season to taste. Chill. 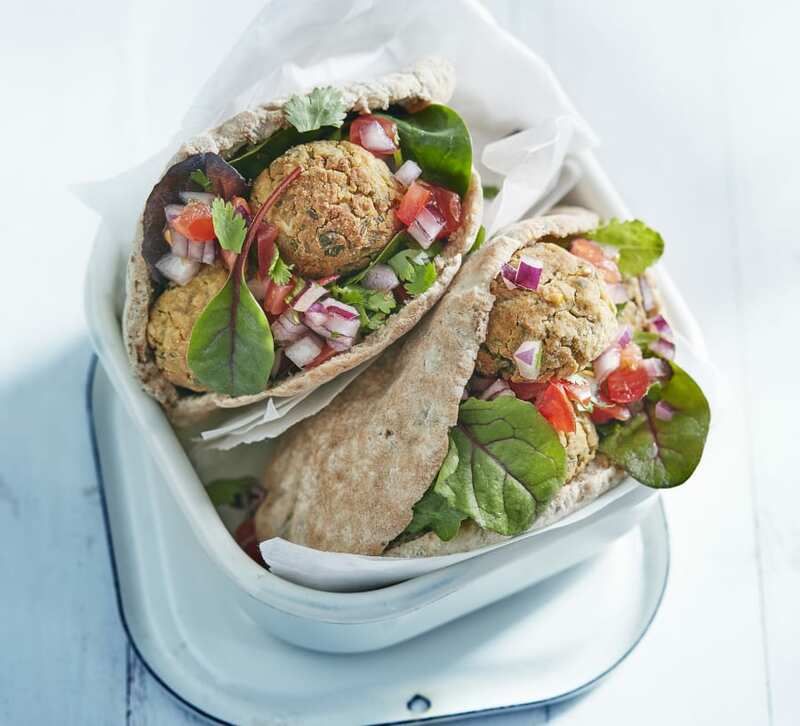 Serve the cooked falafel with the salsa, salad and wholemeal pita breads. "Tofu is an excellent source of protein and calcium and can be used in place of meat in many recipes," Bean said. 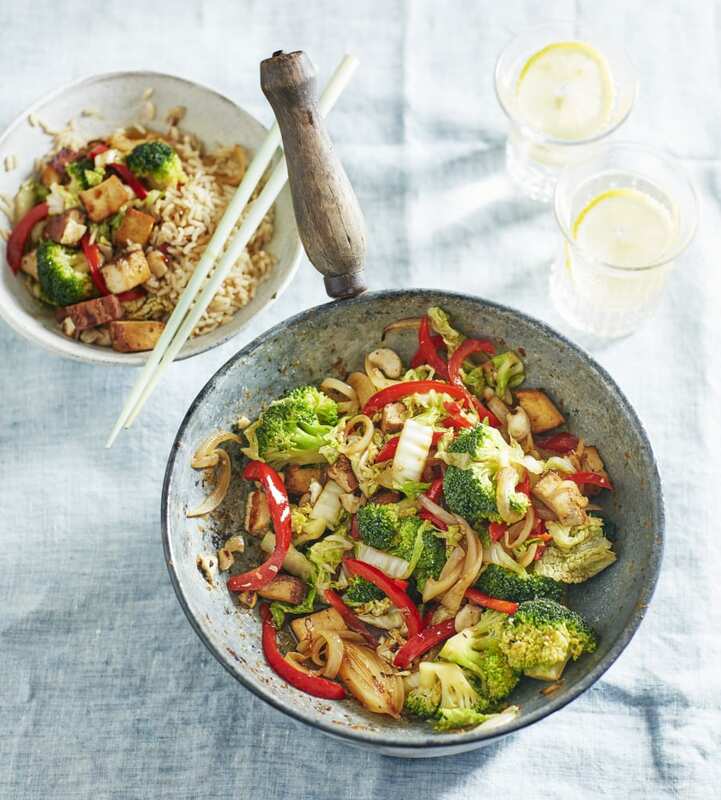 "Plain tofu is quite bland, so I recommend using a ready-made marinated tofu (available in supermarkets) in this recipe for its richer flavour." Heat the oil in a wok until it is hot, add the onion, garlic and ginger and stir fry on a medium-to-high heat for two minutes. Add the pepper, broccoli and cabbage and stir fry for another two minutes. Add the tamari and water, cook for another two minutes then add the tofu. Leave to cook for two minutes. Remove from the heat and then stir in the cashew nuts. Serve with cooked brown rice. "When it starts to get chilly, this is the perfect recipe for a warming mid-week meal," Bean said. 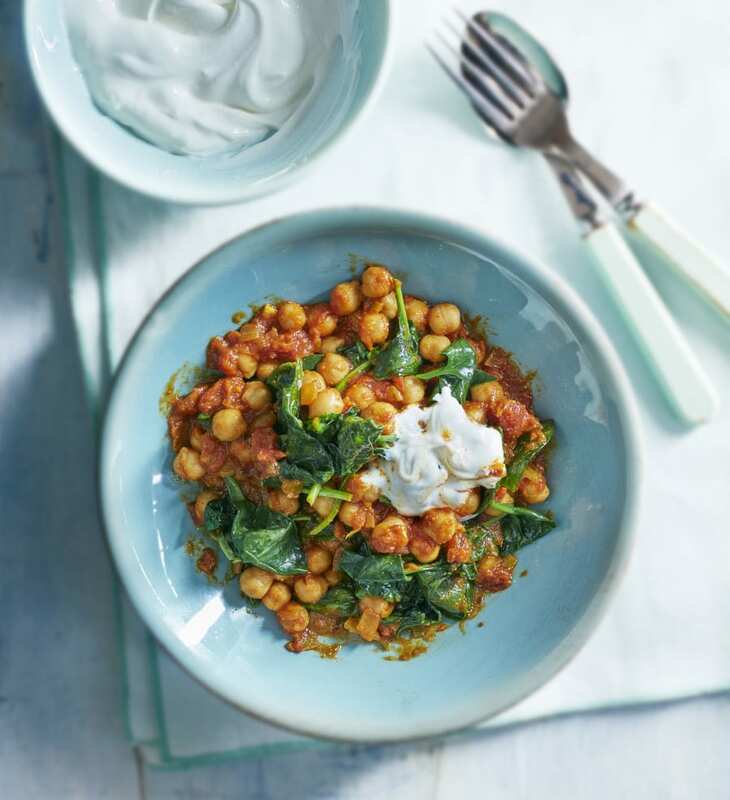 "Chickpeas are an excellent source of fibre, protein and iron. They also contain fructo-oligosaccharides, a type of fibre that increases the friendly bacteria of the gut. Here, I've combined them with spinach, which is a fantastic source of folate and iron." Heat the oil in a large heavy-based saucepan and add the onion, garlic, ginger, chilli, coriander, cumin and turmeric. Cook over a moderate heat for 10 minutes until the onions have softened. Add the tomatoes and chickpeas. Bring to the boil, and then simmer for 10 minutes. Add the spinach and stir until the spinach has wilted. Remove from the heat, season with salt and pepper, and stir in the fresh coriander. Serve with the Greek yogurt (if desired), and wholewheat couscous or brown rice. Recipes and images from The Vegetarian Athlete's Cookbook by Anita Bean. Photography by Adrian Lawrence.